hade selection: Grab a few samples. The light shades are REALLY light. To determine if you have just the right shade apply to your skin, and let it sit for a few minutes. The color changes a little bit as it warms up, and then stays the same all day. Neutral is a great for most Caucasian skin tones...it's a match to the Ebony, and Olive undertones in the powder foundations. If you have strong yellow undertones then check out the Golden range of colors. Like another reviewer has mentioned, this does not stay put very well. I tried using this several times with and without a primer, and also with and without a setting powder. Every time, no matter what I did, this stuff started separating and getting greasy within an hour. It does not blot well, either. I have the blotting papers that don't smudge other foundations, but this one came off like crazy when I tried to blot. Very disappointing. The only thing I truly was impressed with was the fact that every time I took off the foundation at the end of the day (well, what was left of it! ), my skin was amazingly soft and smooth! It makes quite a nice moisturizer so maybe it's best left for people with very dry skin. I will definitely be purchasing other products from Silk Naturals, as I find their service very impressive and they have quite a lot of products with amazing (and safe) ingredients. Even though this foundation wasn't for me, it might work very well for someone else! Thank you, Silk Naturals! This the first foundation that I have ever had tha was an exact match to my skin tone. The first time I applied it was hard to see where it was because it matched so perfeclty, my skin is very dry so the cream formula works well. i since gone on to purchase other silk natural produucts. I found about silk naturals on blog for very fair skin. i have always had a problem with moth foundation being too yellow aor too dark. This foundation is the goldylocks of foundation for me . Just right. I put it on my skin and could not see where it was, that close of match !!!! I love this foundation!! I struggled for years, trying to find the perfect foundation for me. I have really fair neutral skin (N10). All the different foundations I've tried were always too dark, too orange or too yellow. This foundation looks so natural on me, like I'm wearing nothing! I have combination and acne prone skin. I become really oily throughout the T-Zone during the day and have dry patches. Only thing is, I need to use a setting spray for it to stay matte all day. If I don't, this foundation will become really oily. My new favorite foundation! Great medium to full coverage. I buffed it in with a dense kabuki brush, then set it with a pressed powder. Flawless satiny finish. I am a very fair redhead, and the N10 color is perfect and cancels out my redness without being masky. As far as cream or liquid foundations go, this was one of the better ones, not to mention made with natural ingredients! However, it just did not work for my combination/breakout prone skin. It looked pretty cakey around my nose and blemishes, and since I'm going for that "barely there" makeup look, I personally would not use this. I am realizing that powders seem to work better for me, and I would recommend that you teens/young ladies look at SN powders before considering this foundation, because unless you know exactly what you want, this could end up making you look older or too "done up" when you already have pretty, youthful skin. But, if cream really does work better for y'all, have at it! :) This just might be you HG product! I really like this product! It provides great coverage and is a nice match to my skin tone! I am pretty fair complected and I often have trouble finding a foundation light enough for my skin. I was unsure how I would like the roll on stick but its nice. I just draw with it all over my face and rub in. Also I love that it is free of harmful chemicals and the price is right too. Will be ordering again! Although I like mineral foundations, I really prefer a cream or liquid foundation, but I have had trouble finding a vegan foundation in either of these formulas. My search is over! I love this foundation! It feels great and the coverage is just right. And it actually matches my skin; I am fair and many foundations leave a definite demarcation line. As an added bonus, the people who work at Silk Naturals are wonderful! They are friendly and helpful. Did I mention the prices (although with products this good, they could definitely charge more)? Goodbye Clinique, so long Bare Minerals, farewell Erno Lazlo! This makeup is the best! I really like this foundation and the stick formula is ideal for a quick and easy makeup routine. It applies very easily and blends well to leave a nice smooth finish. It sets well with a powder and has moderate staying power but in high humidity, it can wear off quickly. The color also oxidizes in high heat so I bought one shade lighter and it seems to work well after sitting on my face for a little while. Overall I would repurchase because the ingredients and easy to apply formula makes my routine really simple is very much worth it! I got this in the lightest neutral shade and it's so nice. It blends very well (I used the black blending sponge from these guys too) and looks super natural. Defs purchasing again when I run out. I only ordered a sample of this. I bought the N10, even after reading that this stuff does come out super light. I went for it anyway. My skin is so freakin' fair, and most foundations are too orange for me. I actually really liked this. It covers well and spreads nicely. I will buy a full size when the time comes. I may even buy the N20 since the summer months are coming and I do like to look like I see the sun once in awhile, lol. I jumped the gun on ordering foundation despite not getting through my old CoverGirl Olay stuff yet... the second it's done, I'm making the leap for this stuff which is a big deal. I've been using the same foundation since its debut. So finding something that I equally love, if not more...well... that's pretty epic. Was going through the phase of sampling a lot products trying to find a good, natural foundation just for those special occasion days and this hd foundation is perfect. It doesn't cake, easy to apply and makes your skin look natural but better. So I think my search is over, going to stick with this wonderful foundation! I ordered a few samples, and found that N30 was perfect for me and i am in love with this creamy foundation! I have used mineral powders for many years, but have been fed up with the dryness and it making my skin look worse.. For the cheap price and the opportunity to order samples, even to denmark, i tried this out and I'm so glad i did! I love that I dont have to apply this all over my face, but just wherever I have redness or spots, making my face look very natural, dewy and not mask like/dull.. It has a minor tendency to settle around dry patches, but it blends more even throughout the day and if you remember to warm the product up between fingers it is barely noticable.. i have dermatitis myself, and it does a good job covering it without worsening it :) Will soon buy full size of this and the concealer! I have beenReview by Noel K.
I have been using mineral foundation for ages, but it has recently starting to look a bit powdery on my skin so I thought I'd give the HD Cream Foundation a try. I was a bit hesitant about using a cream foundation on my oily skin, but as it turned out, I had nothing to be worried about. The foundation applies easily with a blending sponge or a makeup brush and settles in like a second skin. I follow with the vegan perfecting powder and a little setting spray, and my makeup lasts all day. The sample-sized pods make it easy to try out a few different levels without spending a lot on a product that is too dark/light/etc. Overall, I am really impressed with this foundation. It is super affordable, and my skin looks like my skin, just better. I was reallyReview by Shannon P.
I was really excited to try this foundation and I was banking on it being my new HG foundation due to the other raving reviews. I have used the mineral foundation, but I found I needed to wear a lot to achieve decent coverage. It was by no means cost effective, and with the summer approaching, I wanted something that felt lighter. I ordered samples in N10, N20, N40, G10, and G20. N20 (which looked barely any different from G20) was a perfect match to my neck, and I applied it with a flat top brush and set it with a translucent powder. It looked nice and natural. Unfortunately, the foundation would NOT stay put on my face. This made it IMPOSSIBLE to build a full enough coverage to disguise the redness on my face. It never dried to a matte finish. Every time I touch my face, I get foundation all over my hands. It looks great for about an hour, but it does NOT wear well. I absolutely loveReview by Rachelle H.
I absolutely love this foundation. Living in the dry climate of Las Vegas I can't wear powder mineral foundation and have been looking for a nice liquid mineral type foundation for a long time. This makes my skin look amazing. It blends right in, looks totally natural and balances my complexion completely. I will never use anything else. The price is great and it doesn't contain bad stuff for my skin. Thank you for a wonderful product! i actually likeReview by Ashley b. Since shipping InternationallyReview by Monika M.
Since shipping Internationally costs in terms of time, shipping rate, and then taxes and processing fees on entry here, I prefer larger orders over several small ones. So I did some guessing and took a risk. Pros are: lovely finish; easy to apply with the stick to problem areas and a few extra little stripes, and use a soft brush to spread from there over the face; no breakouts unless I sleep in it; no cracking or melting over time; great pore coverage. Cons are: when applying with the stick directly to the face, I had a few pieces crack off the stick, which now I have to use fingers to use up and get on my face as my soft brush does not pick up enough of it. I have not tried: using a beauty blender brush with this; or using a firmer brush. 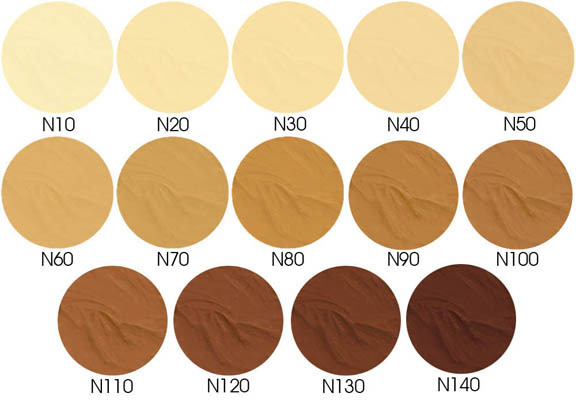 MY personal cons: N30 is a bit dark in terms of tone on me, and N20 is a bit light; both are a bit yellow-green, meaning that my complexion is cooler and more pink than this, rightly advertised as such, NEUTRAL toned foundation. Like others, I do have some rosaceae-like redness too, but my skin undertone even after this foundation has counteracted that redness, is still more cool and pink than the foundation, so it ends up looking a bit green on me. Yes, I can combat that by using an overly pink-for-me foundation to set it, and ensuring I use both bronzer and blush to better balance it. Honestly I expect this will work quite well for many people. But I wonder whether there will be a place for a COOL Tones set of these foundations??? :) That would be awesome! As it isn't fair to penalize this foundation for not being the right colour for me, I give it a 4. A very convenientReview by Ludmila K.
This is myReview by Chelsea L.
This is my favorite foundation I've ever used, and I've worked for several high-end cosmetics companies and used foundations at all ends of the price spectrum. This lasts well on the skin, is non-irritating to my very reactive skin, and the color selection works well for me! I purchased N10, and I have extremely fair, neutral-toned skin that I have a difficult time finding a match for, and this is perfect, although I would like this even if I bought the white to mix! I am 40Review by Teena C.
I am 40 and very fair. I got the lightest neutral. It is a good porcelain/beige Claire . It seems very full coverage, but actually, allows your natural skin tone to come through a bit. I dabbed and blended with fingertips. I gently powdered a mineral foundation on top. I did my "face" and finished with the vegan finishing powder. It looks really nice a couple hours later. I do not have ANY lines that are enhanced under my eyes or any dryness or burning on the side of my nose. I was surprised. really! I would get an extra sample for the purse/bag as it is a solid compact cream and it wont leave a mess!